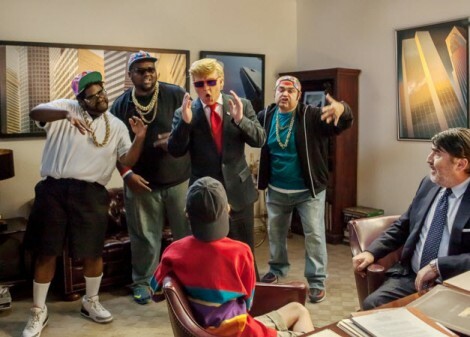 Watch the entire Donald Trump Funny or Die video starring Johnny Depp below! Wait until you see the star’s amazing transformation into the former Celebrity Apprentice star and wacky presidential candidate. It’s crazy! If you are a fan of Drunk History, you may recognize the name of Jeremy Konner, who created the series, and serves as director on The Art of the Deal: The Movie. The script for the short film, according to the New York Times, was penned by former The Onion editor Joe Randazzo. In keeping with the idea of the movie having been filmed in the 1980’s and only recently uncovered, the theme song for the Funny or Die parody was written by Kenny Logins.